The Serbian ambassador to Nato has died after jumping from a multi-storey car park in Brussels airport. 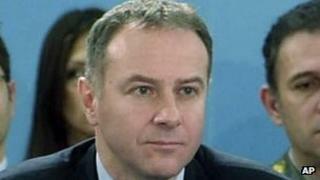 The Serbian government confirmed that Branislav Milinkovic, 52, had died on Tuesday, but did not give details. It paid tribute to his work. Emergency services were called to the scene, but were not able to revive him, sources at Brussels airport said. Prosecutors in Brussels say they are treating Mr Milinkovic's death as a suicide. He is thought to have been at the airport on Tuesday evening to meet Serbia's deputy foreign minister and other officials who had arrived in Brussels for diplomatic talks. The incident happened at around 18:00 (17:00 GMT). After talking with colleagues, Mr Milinkovic suddenly strolled to a barrier, climbed over and flung himself to the ground below, a diplomat told the Associated Press. Earlier on Tuesday, Mr Milinkovic had seemed "completely normal, talking to journalists in the corridors of Nato", a Serbian journalist in Brussels told the AFP news agency. Nato Secretary General Anders Fogh Rasmussen said in a statement that he was "deeply saddened" by the news. "Ambassador Branislav Milinkovic was a highly respected representative of his country and will be missed at Nato headquarters," Mr Rasmussen said. Serbia is not a member of Nato but it does have a mission at the alliance's headquarters in Brussels because it belongs to the Partnership for Peace programme, which helps countries co-ordinate on defence and security issues. Mr Milinkovic had been an ambassador since 2009. He had previously worked as a journalist and was an active opponent of Serbia's former leader Slobodan Milosevic. He leaves behind a wife and a six-year-old son.